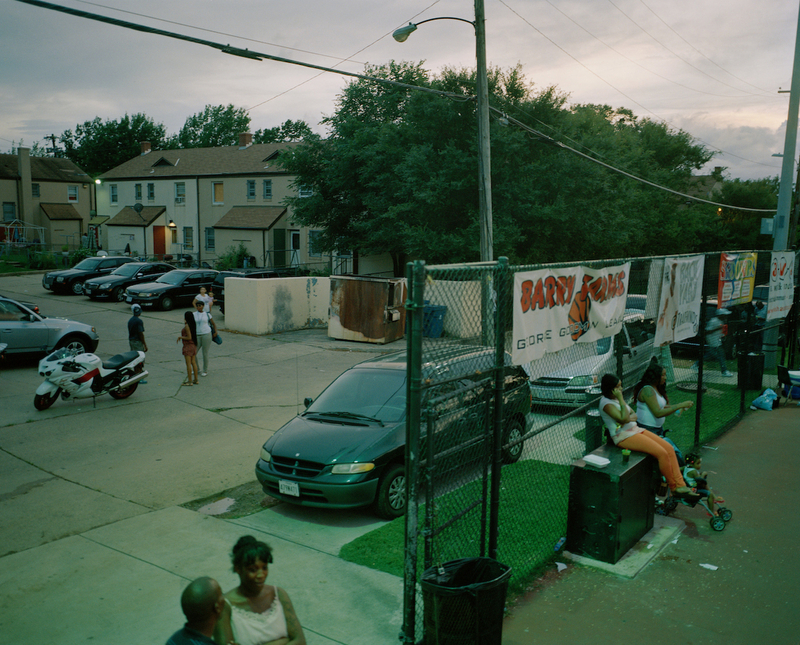 Washington, a city of contrasts, is divided into four uneven quadrants, one of which is separated from the rest of the city by the Anacostia River. 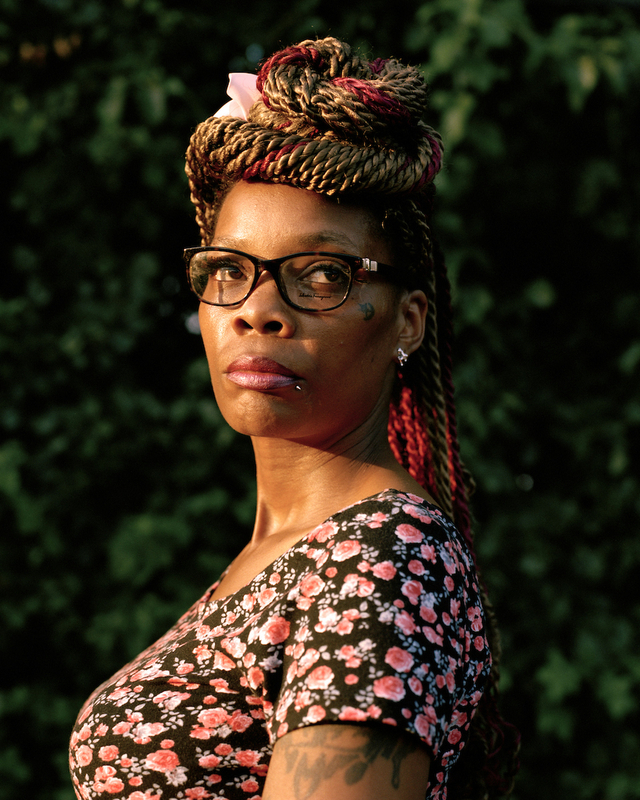 When photographers come to the east of the river communities, their quick sojourns and photographic rhetoric too often varies little from a reductive narrative of poverty and violence, is usually photographed in black in white, and continues a pattern of pathologizing communities of color. Enter Jared Soares. I first saw Jared’s work at a small community photography gallery in the Anacostia Arts Center where he was displaying his work The Farms. Barry Farm has a reputation in D.C., a public housing project with a storied history, mostly forgotten, and now slated for redevelopment. The land upon which Barry Farm sits was purchased by General Howard, former Civil War general, and then head of the newly created Freedmens’ Bureau, to provide land and opportunity to the formerly enslaved and free peoples of color. Jared’s work, The Farms, focuses on the best of the east of the river communities: the palpable sense of community spirit and neighborly concern that defines this area for me. He sensitively captures the portrait of a place whose identity has too often been conscripted into a caricature. 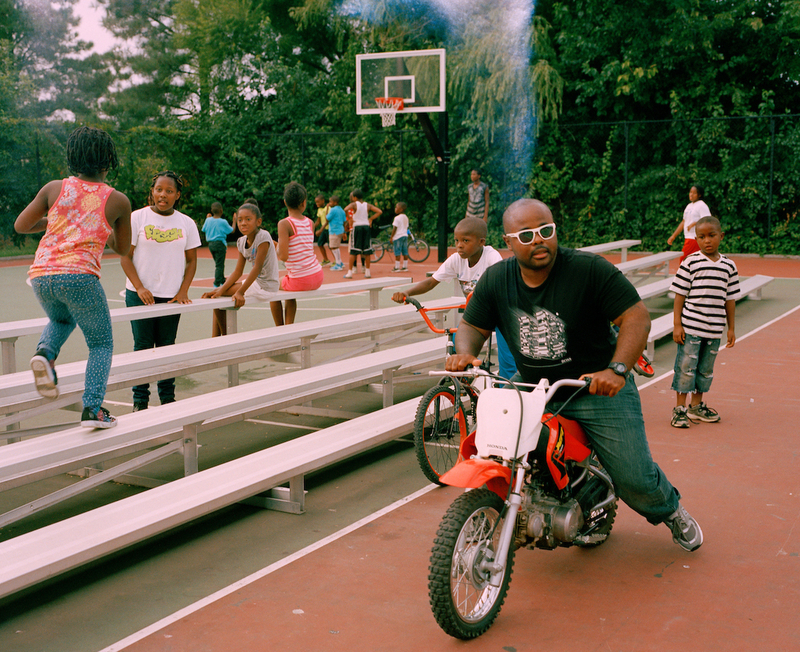 Jared Soares lives and works in Washington, D.C., splitting his time between commissioned work and producing personal projects that explore the intersection of community and identity in contemporary American life. Jared’s work has been exhibited in both group and solo shows at venues including Museo d’art Contemporena, Roma; The O. Winston Link Museum; Longwood Arts Gallery and during Look3 Festival of the Photograph. His Small-Town Hip Hop project was exhibited as a solo show at The Blue Sky Gallery in Portland, Oregon for the month of November 2014. His artist books and prints are held in the permanent collections of the Portland Art Museum, Sloane Art Library at The University of North Carolina at Chapel Hill, and The Indie Photobook Library among others. He has been awarded grants by the National Press Photographers Association and the Puffin Foundation. When he’s not making photographs, Jared can be found playing pickup basketball games at Guy Mason Park or walking his pet terrier or looking for flights to Kansas City or Hawaii to visit family. Please don’t use the term “streetball” to describe any of the action you see at The Farms. This asphalt haven is one of the few places where individuals can turn away from the rough realities of life. The burden of peace doesn’t always rely on the play or the players, but rather, the show of community. 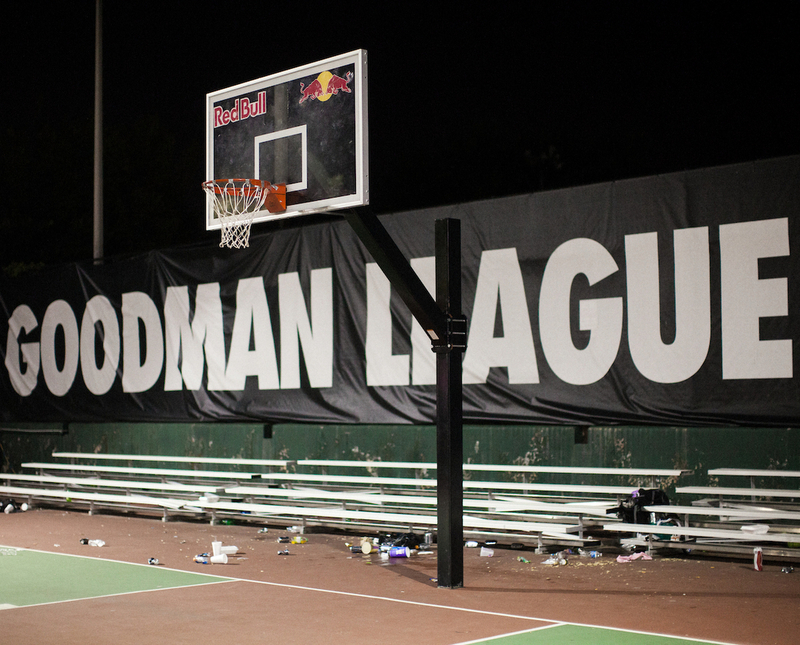 Welcome to The Goodman League. 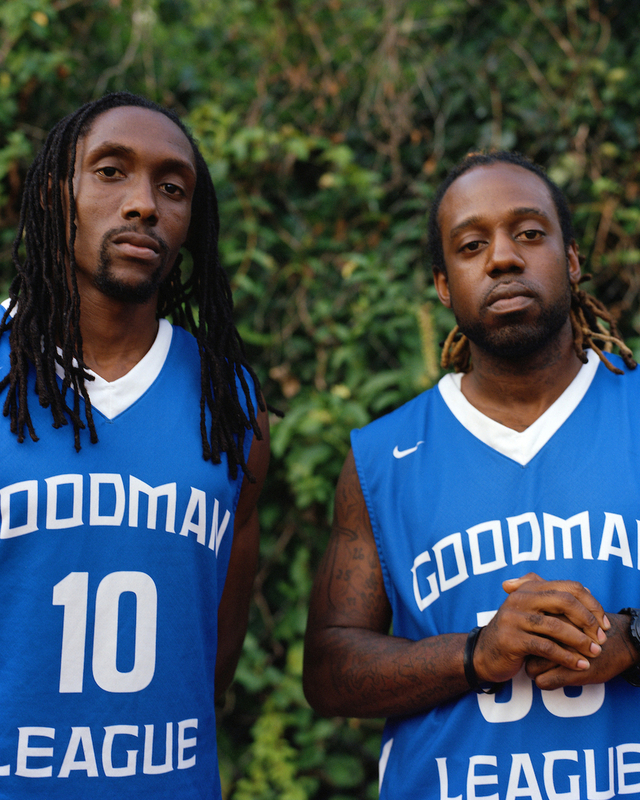 For 39 years The George Goodman League has been a summer staple for basketball fans in the District of Columbia. The Barry Farms Dwellings court has played host to the likes of NBA All Star Kevin Durant, U.S. Secretary of Education Arne Duncan, President Obama’s former personal assistant Reggie Love, local legend Jamar Board, former And1 streetballers Baby Shaq and White Chocolate along with college and local area talent. Hugs and hand pounds are a common sight. Laughter and smiles are a mainstay. Weekend games feel like a homecoming reunion. A little trash talk might be exchanged but it’s all love inside the gates. ©Jared Soares, Goodman League player Gerard Jones displays a basketball and Washington, DC themed tattoo before a game during the summer 2013 season of The George Goodman Basketball League at Barry Farms Dwellings basketball courts in Southeast Washington, DC. 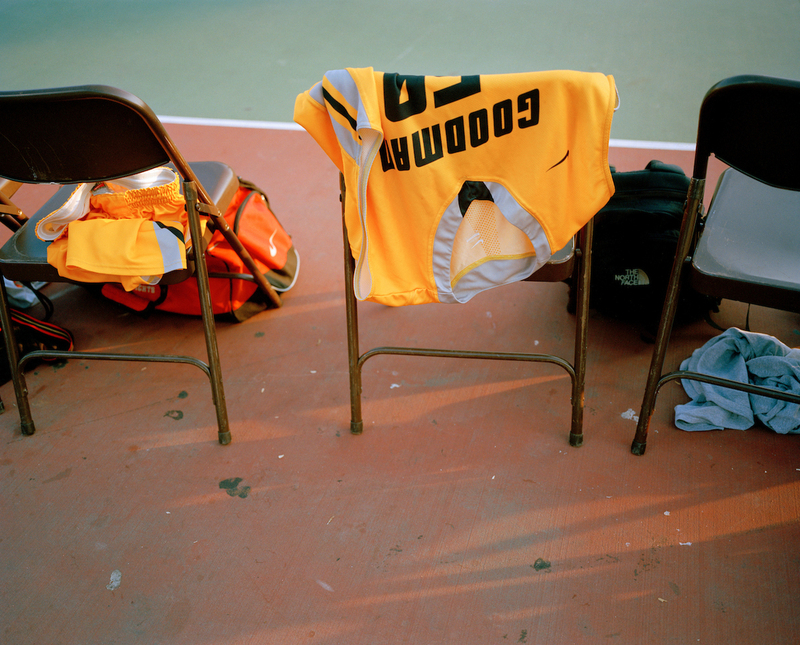 ©Jared Soares, A jersey rests on a chair during warm ups before a summer 2013 George Goodman Basketball League game at Barry Farms Dwellings basketball courts in Southeast Washington, DC. Players have to change into the uniforms once they arrive at the court. 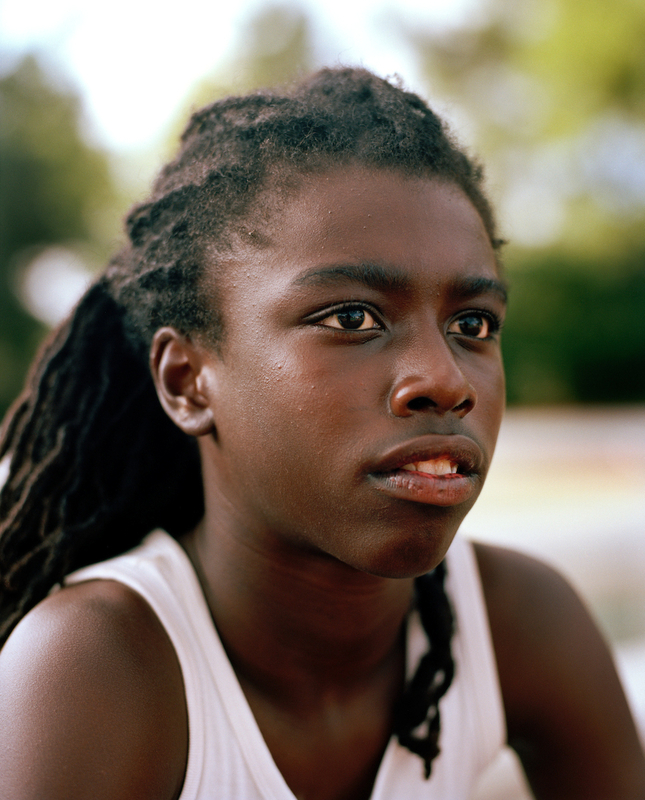 ©Jared Soares, Walker, who is one of the many teens that play pick up games on the courts before The George Goodman Basketball League games tip off at Barry Farms Dwellings basketball courts in Southeast Washington, DC. 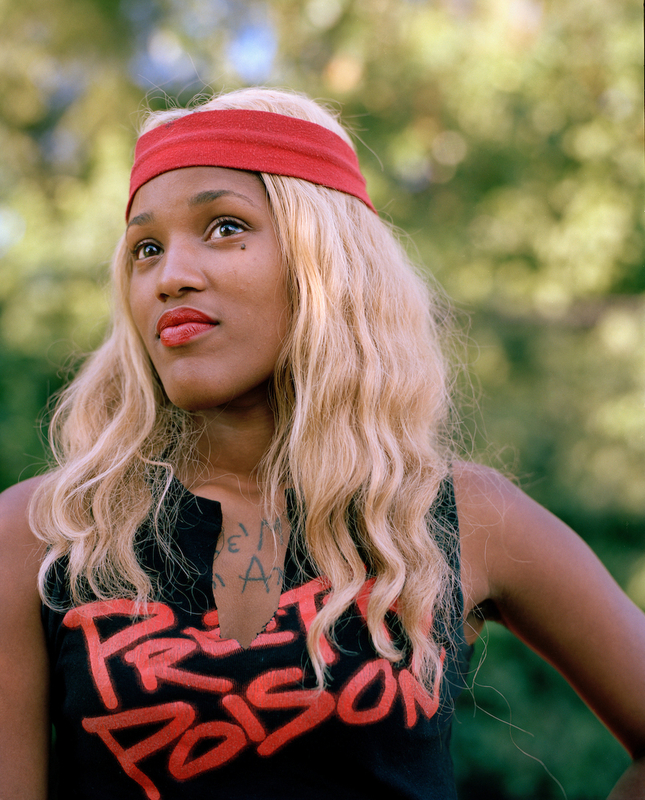 ©Jared Soares, Danielle Dean often brings her two children to watch George Goodman Basketball League games Barry Farms Dwellings basketball courts in Southeast Washington, DC. 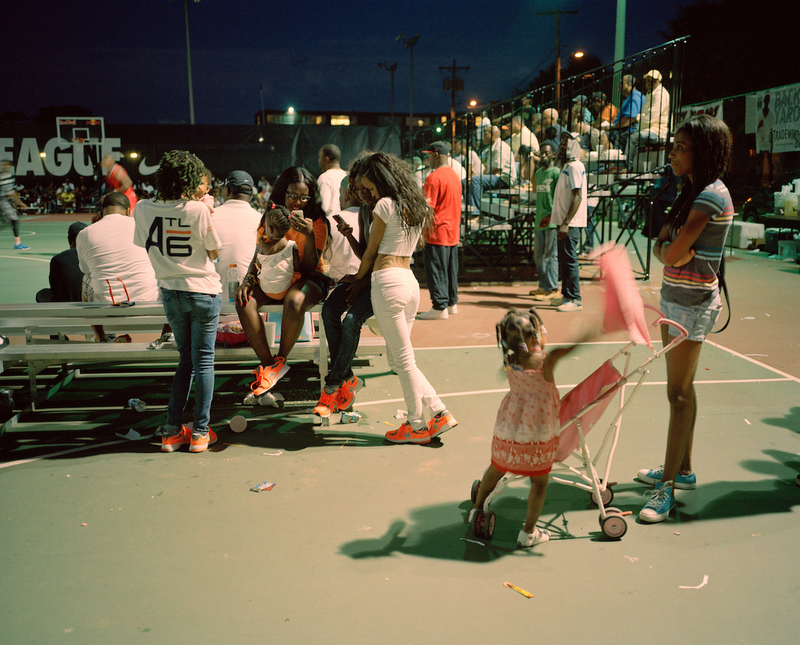 ©Jared Soares, Teenagers and children play on the courts before a summer 2013 George Goodman Basketball League game at Barry Farms Dwellings basketball courts in Southeast Washington, DC. ©Jared Soares, Goodman League Operations manager , Kenneth Newton, center, chats with teens before the start of a summer 2013 George Goodman Basketball League game at Barry Farms Dwellings basketball courts in Southeast Washington, DC. Some of Newton’s duties include managing equipment, setting up the scoreboard and concessions. 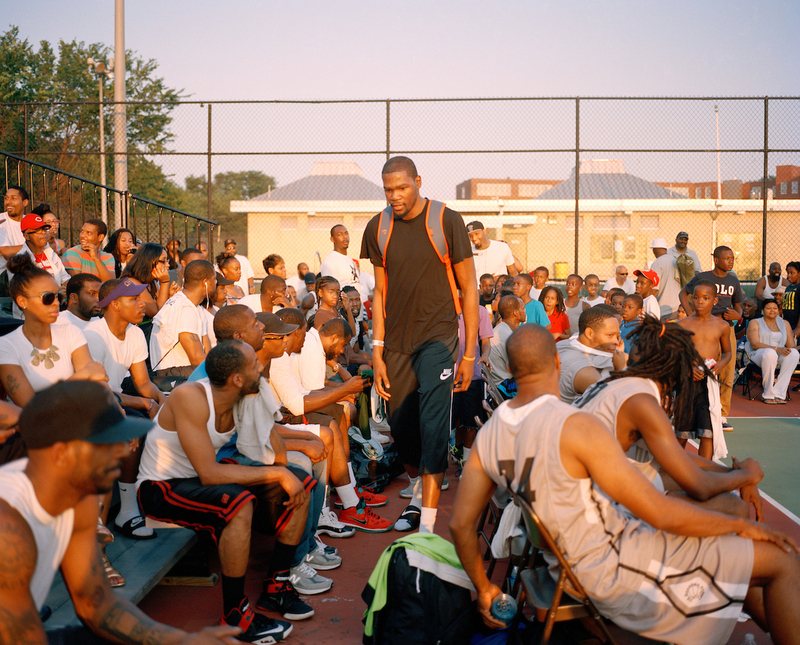 ©Jared Soares, Oklahoma City Thunder and Washington DC native, Kevin Durant makes his way to the bench to pick up his uniform for a summer 2013 George Goodman Basketball League game at Barry Farms Dwellings basketball courts in Southeast Washington, DC. Durant, who has been an NBA All Star and scoring champion has played in the Goodman League since he was a teenager. He often makes appearances throughout the summer. ©Jared Soares, Goodman League fans take in on court action during a game at Barry Farms Dwellings basketball courts in Southeast Washington, DC. 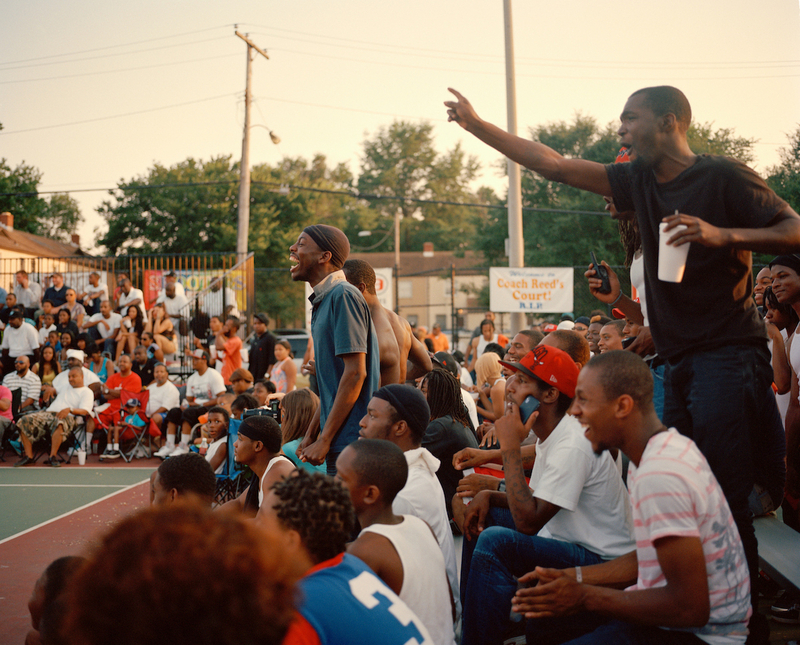 ©Jared Soares, Members of the BF Crazies section cheer after a dunk during a summer 2013 George Goodman Basketball League game at Barry Farms Dwellings basketball courts in Southeast Washington, DC. A few seating sections have been given nicknames such as Season Ticket Holders, 9-5 Crew, and The Lane Mob. 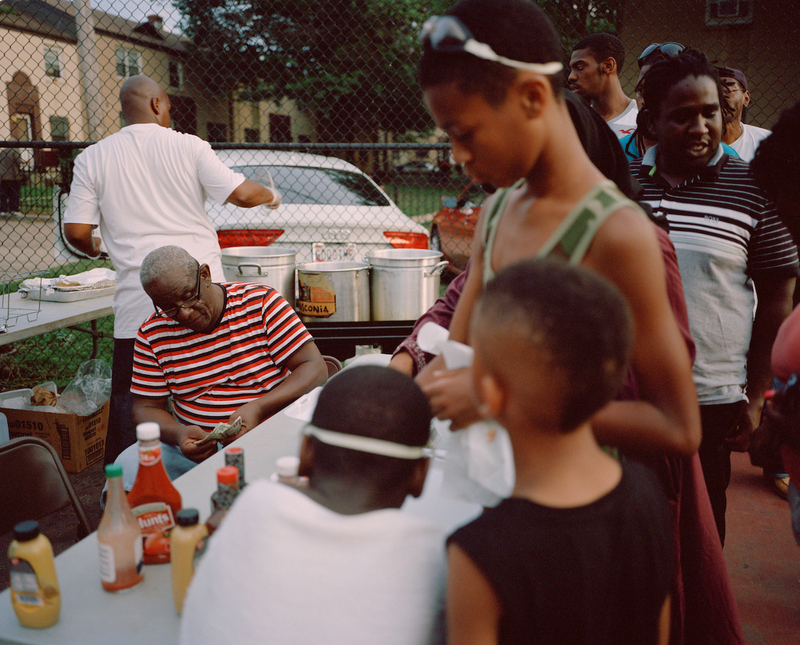 ©Jared Soares, Fans line up to purchase snacks during halftime of a summer 2013 George Goodman Basketball League game at Barry Farms Dwellings basketball courts in Southeast Washington, DC. 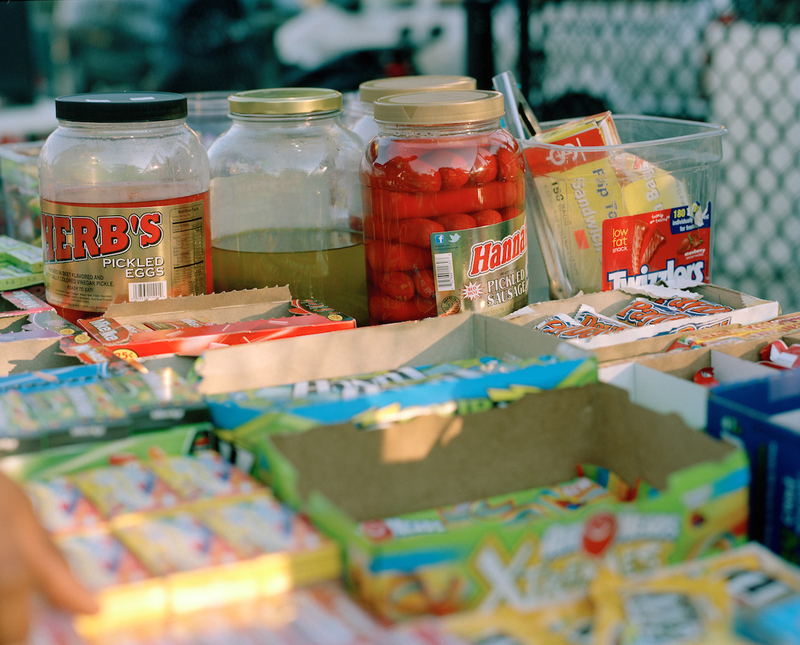 Goodman League faithful can indulge in freshly fried fish, chicken tenders and french fries among the regular staples of popcorn and candy. ©Jared Soares, Concessions seen during a summer 2013 George Goodman Basketball League game at Barry Farms Dwellings basketball courts in Southeast Washington, DC. 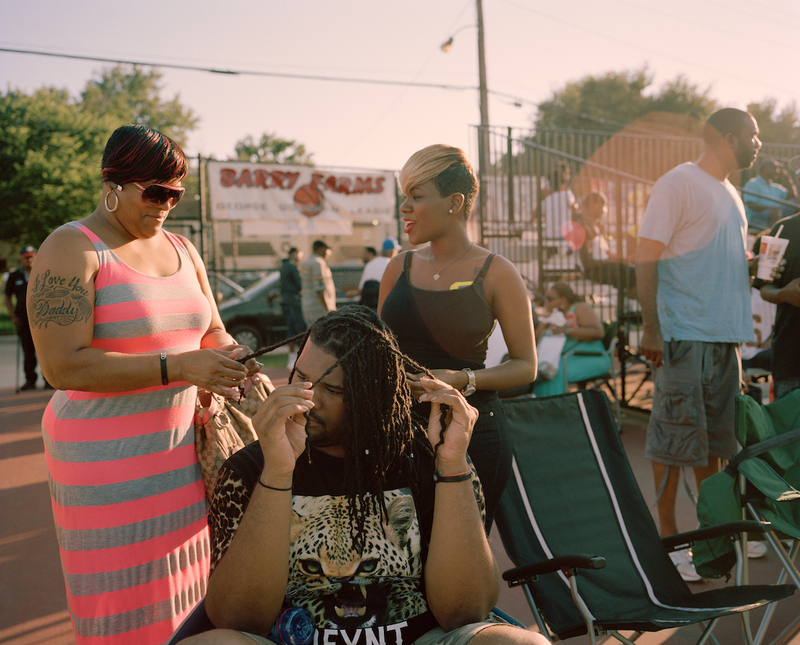 ©Jared Soares, Antonio Logan-El, center, has his hair twisted by friends before the tip off of a summer 2013 George Goodman Basketball League game at Barry Farms Dwellings basketball courts in Southeast Washington, DC. 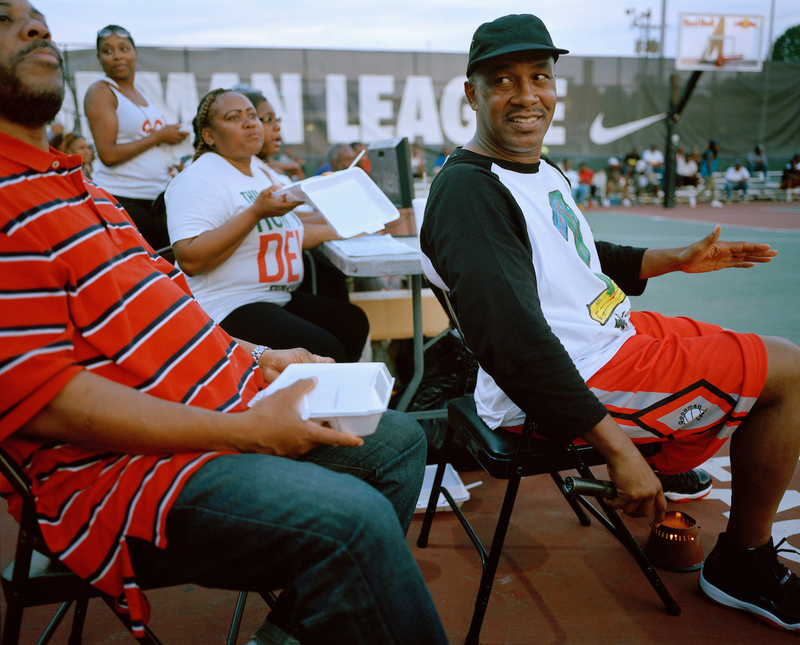 ©Jared Soares, George Goodman League commissioner and emcee, Miles Rawls, right, during a summer 2013 league game at Barry Farms Dwellings basketball courts in Southeast Washington, DC. Rawls, who was born and raised in Barry Farms, will enter his 18th season as commissioner next summer. His day job is with the Department of Homeland Security. 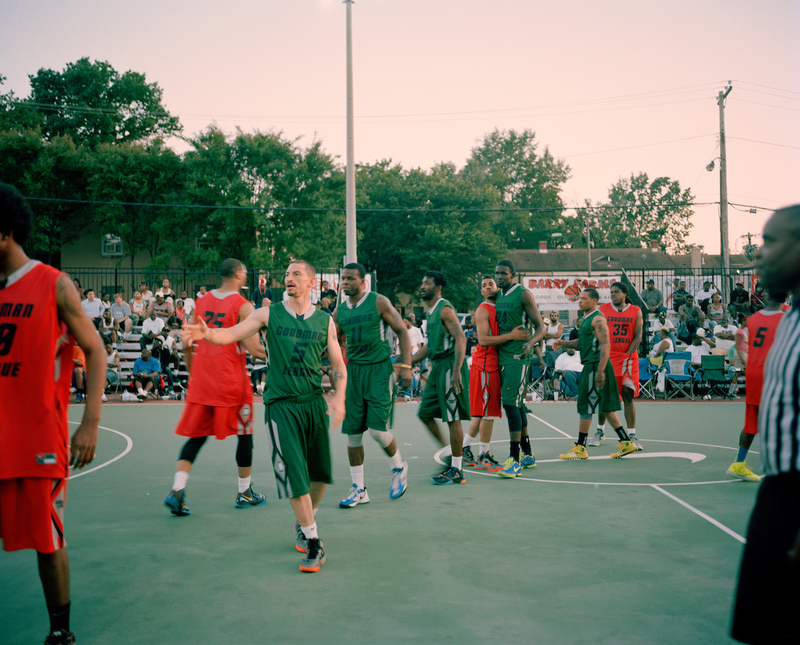 ©Jared Soares, The White Chocolate All Stars and Uptown Elite shake hands after a summer 2013 George Goodman Basketball League game at Barry Farms Dwellings basketball courts in Southeast Washington, DC. 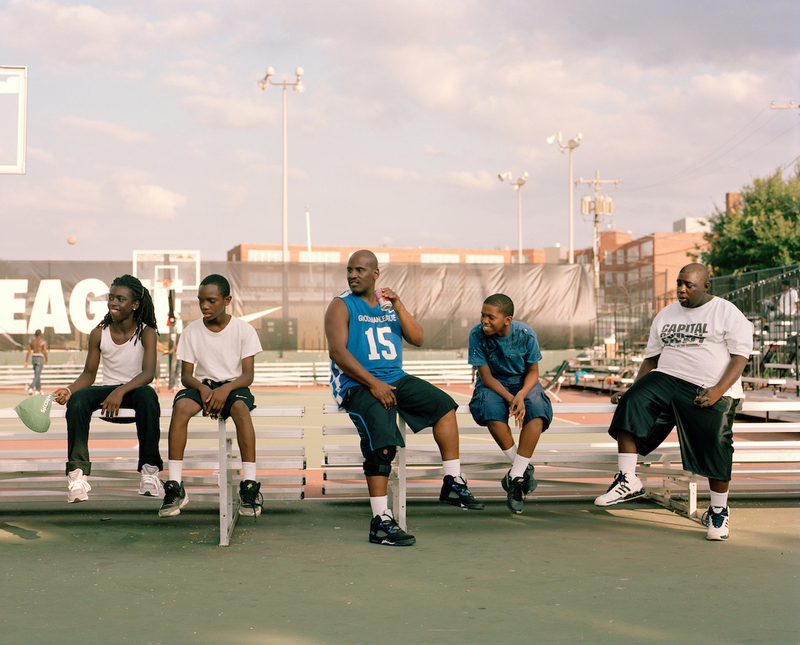 ©Jared Soares, Spectators prepare to enter the gates of for a summer 2013 George Goodman Basketball League game at Barry Farms Dwellings basketball courts in Southeast Washington, DC. 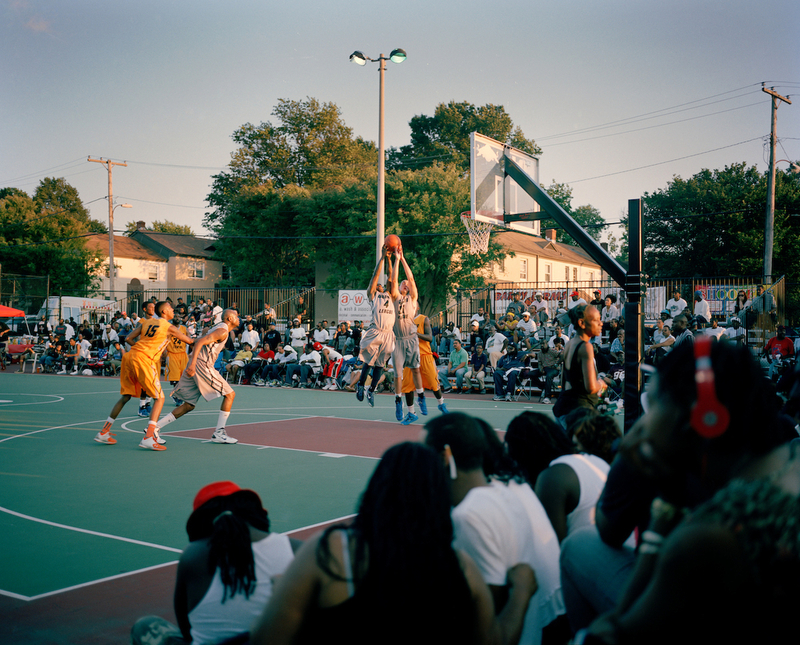 ©Jared Soares, Goodman League fans during a game at Barry Farms Dwellings basketball courts in Southeast Washington, DC. 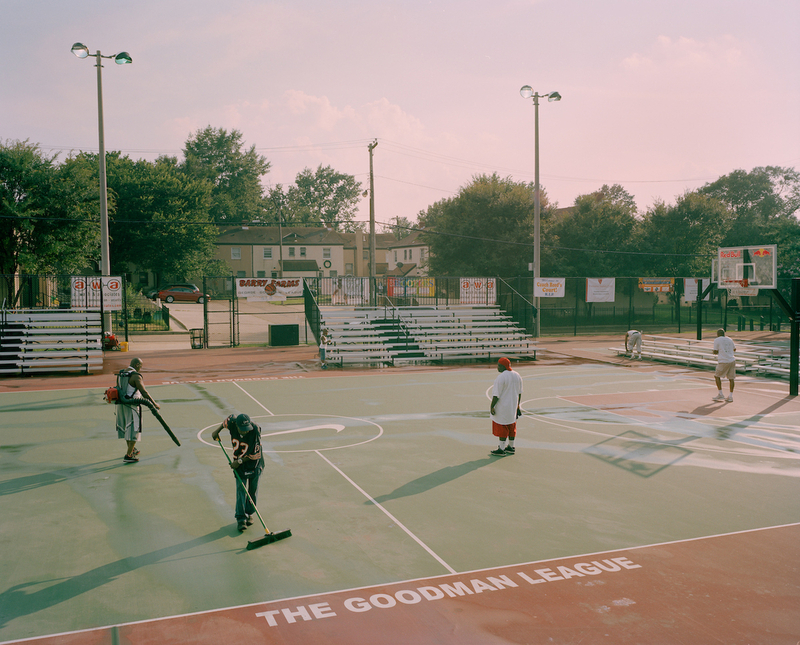 ©Jared Soares, An empty court after the Drew All Stars celebrated their Goodman League championship win over the Roc Boys to conclude the summer 2013 season at Barry Farms Dwellings basketball courts in Southeast Washington, DC.